There is nothing I love more than finding an amazing new insect to tell you about! 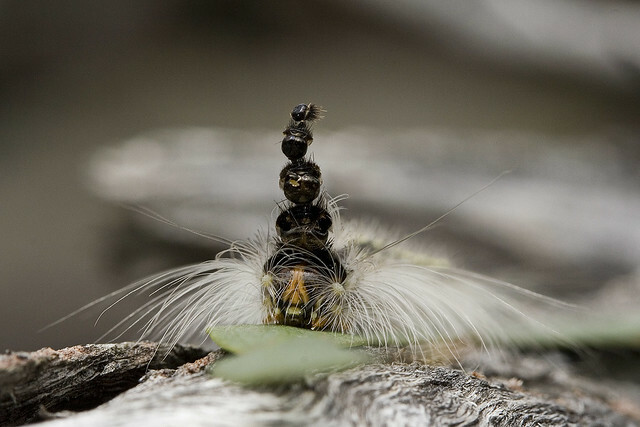 Today it’s the “Mad Hatterpillar.” As you can see from this photo, these caterpillars (Uraba lugens, larvae of a Gum Leaf Skeletoniser moth) have a strange attachment to their heads. It’s a stack of their shed head capsules! These caterpillars are native to Australia and eat eucalyptus trees. Where do they get all these extra heads, anyway? Moths and butterflies are just flying gonads that make new caterpillars. Caterpillars are feeding machines with one primary purpose: eating enough food to build the body of a future moth or butterfly. A caterpillar stuffs itself with food, but eventually is limited by its exoskeleton, which is rigid and can’t grow. ‘Pillars deal with this by splitting their external skin, shedding it, and making a new, bigger exoskeleton so they have room to grow. For some reason, this species of moth caterpillars keeps their heads and build themselves a strange “hat” that gets taller as they grow. If you do happen to see one of these, you should not touch it! Apparently these caterpillars are covered with highly itchy and irritating spines–which seems to make their chapeau of old heads a bit redundant. Most newer publications about this insect focus on its status as a pest of Eucalyptus, rather than it’s strange headgear. Clearly this is a thesis in search of a graduate student! By the way, some related Nolid moth caterpillars have balloon heads, which is freaky in an entirely different and wonderful way. McFarland, N. (1980). Retention of cast head capsules by some nolid immatures in four Old World countries. Journal of Research on the Lepidoptera., 17 (4). Thanks very much to nuytsia_pix for letting me repost these photos! Nice! That is pretty odd. I think some kind of anti-predator hypothesis is likely. Perhaps anti parasitoid? Maybe the tachinids oviposit on the “empties”. Perhaps they’re just terribly formal? The side view made me think of a possibility. The heads look like a ‘tail’. 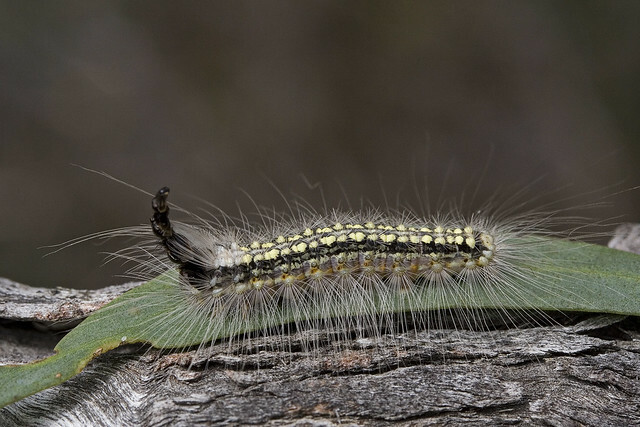 Some caterpillars have tails that are repellent to predators either with more hairs or nasty chemicals. This might be a mimic for a tailed caterpillar that also lives on eucalyptus? BTW hatterpillar is brilliant, unforgettable. Awesome, thanks for the tip Adrian! Interesting that the reason for this behaviour still remains unclear. Hopefully someone will get to the bottom of this weird headgear. Okay, the Three-Spot wins. It fell from the Ugly Tree and hit every branch on the way down. A strange form of hoarding – just can’t throw anything away? Throwing a random layperson speculation out there: Could it be that the head-stacking behavior evolved as an anti-predator defense before the coating of irritating spines was anywhere near its modern form? So let’s say at some point in the distant past, this species had proto-spines that discouraged predators a bit, but not nearly to the degree they have now. A predator takes a peck of the heads and finds it unappetizing, then it makes a peck on the body and while that tastes better, now there is some mild irritation from the proto-spines — predator thinks, “Hell, this ain’t worth it,” and moves on. Later, the spines evolve to the point where they are a sufficient deterrent on their own, and the head-stacking behavior becomes vestigial. The larvae of tortoise beetles hang their excrement over their bodies. Maybe they also hang cast skins? I dunno. I love how people always attempt to story-tell the reason for things like this. The hat is there because it has not been selected against, not that it has been ‘selected for’. A long time ago a caterpillar was born that happened to grow a hat. Nothing about the hat made it more likely to die, so when it’s offspring were born they too had hats and so on. Either by chance, or because one of these hat wearing caterpillars had another useful adaptation (like a spiky waistcoat that repels birds but excites the ladies) hats became dominant. Sometimes stuff just happens. I’m curious about the _how_ of the hat-stack, if anyone can enlighten me. Do the old headshells remain attached (say at the base of the “neck”) when the old skin is shed? So they’re like a fingernail that’s never been trimmed?